In the latest escalation of hostilities stemming from the kidnapping and murder of three Israeli teens, over 20 people were killed in Gaza as Israel launched airstrikes on the region this week. Prime Minister Benjamin Netanyahu has ordered the Israeli military to “take their gloves off,” and Defense Minister Moshe Yaalon said that Israel is “preparing for a battle against Hamas which will not end within a few days.” Meanwhile, Hamas has continued to send rockets from Gaza into Israel, and Israel refuses to rule out a ground invasion of Gaza. This most recent iteration of the decades-old conflict between Israel and Palestine has the potential to turn much more violent very quickly. But how did this all escalate so fast? Why did Israel launch airstrikes on Gaza? And what does all of this have to do with the Israeli teenagers who were kidnapped and murdered? Here’s a basic rundown of what’s going on in Israel right now — and what it says about broader attempts to broker peace between the two sides. So did all of this start because a couple of Israeli teenagers were kidnapped? Sort of, but not really. The kidnappings were more of a catalyst by which existing political tensions were reignited. In the grand scheme of the conflict, the kidnappings and subsequent murders themselves didn’t really cause any new problems that weren’t already there. They just exacerbated the situation. In mid-June, three Israeli teens went missing in the West Bank. A couple of weeks later, their bodies were discovered with gunshots to the heads, also in the West Bank. Many in Israel assumed the murders were the work of Palestinian extremist groups: The families of all three teens had ties to the far-right Israeli nationalist party Jewish Home, and their bodies were discovered near the city of Hebron, a hotspot for Israeli-Palestinian violence. Two little-known Palestinian radical organizations have claimed responsibility for the kidnappings; the Israeli government blames Hamas, which denies involvement. Less than a week after the discovery of the teens’ bodies, a Palestinian teen was found beaten and burned to death in Jerusalem in what was widely perceived as retributive killing. Six Israelis were arrested for that attack. Why is the Israeli government launching airstrikes? A lot of this comes down to where the kidnappings took place. The teens lived (and went missing) in the West Bank, which is one of the biggest epicenters of tension within Israel. The territory was seized by Israel from Jordan in 1967, and so the 2.5 million Palestinians who live there consider it to be occupied territory (as does most of the rest of the international community). Nevertheless, the Israeli government has constructed settlements and communities in the West Bank as a concerted attempt to repopulate the region with Israeli Jews. The three kidnapped teens were West Bank settlers; whether they had the right to live where they were living gets to the heart of one of the most divisive issues in the entire Israel-Palestine debate. Not surprisingly, all of this has resulted in widespread protests on both sides of the issue. OK, but why airstrikes? And what does this have to do with Gaza? Ostensibly, Israel is bombing Gaza in retaliation for the missiles that Palestinians in Gaza periodically lob over the border and into Israel. These rocket attacks — which aren’t uncommon — have increased over the last few weeks, in part because of the Israeli government’s actions in response to the kidnappings. During its investigation, Israeli police detained between 80 and 100 Palestinians, and severely beat a 15-year-old Palestinian-American who was vacationing in Israel. 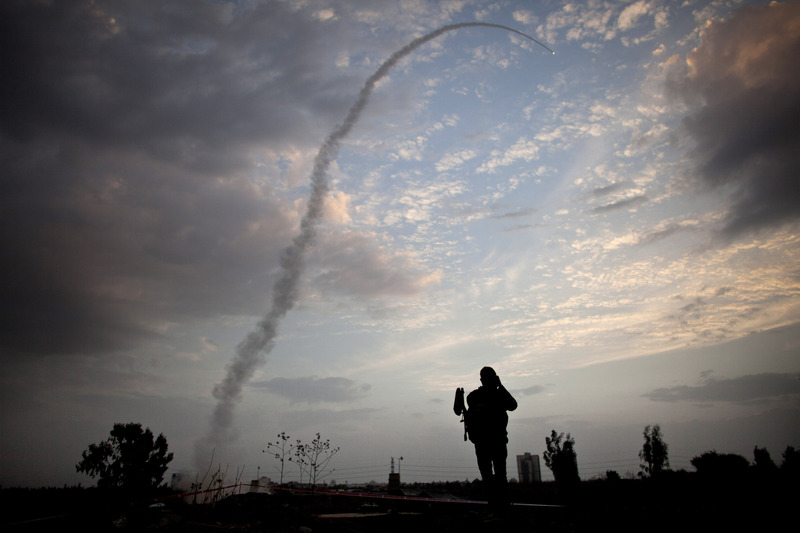 Who in Gaza is launching missiles into Israel? And why? Hamas. The militant Palestinian political organization that governs the Gaza Strip has a number of motivations for launching the missiles, but a lot of it comes down to a) past Israeli attacks on Gaza and b) the Israeli government’s blockade of Gaza. While it sends a lot of rockets over — a couple of hundred every year, give or take — very few of them cause any injuries or casualties. The vast majority of them either get intercepted by the U.S.-funded Iron Dome defense system, land innocuously outside of urban areas, or fail to launch. What’s the beef between Gaza and Israel again? Like the West Bank, Gaza is occupied territory. (Both regions were seized during the same war.) For most of the last 40 years, Gaza was governed by Israel, but the Israeli government withdrew unilaterally in 2005, and now the region is controlled by Hamas. Unlike the moderate and secular Palestinian group that administers the West Bank, Hamas is a militant Sunni Islamic organization that seeks the complete destruction of the Israeli state. It has perpetrated numerous attacks against Israel, largely in the form of suicide bombings and rockets, and has been designated a terrorist organization by the U.S. In part because of the missiles coming out of Gaza, Israel instituted a blockade of the region in 2008, and that blockade is still in place. While the strip itself is still be governed by Hamas, the Israeli government monitors and severely limits trade in and out of the region. The Israelis say that this is to prevent the transfer of weapons materials, but Hamas and others contend that Israel is depriving the region of crucial goods, including food and medical supplies. In 2008, Israel launched a brutal ground invasion of Gaza, again in retaliation for rocket attacks. Between 900 and 1,300 Palestinians were killed, the majority of which were civilians and children, while only 13 Israeli soldiers lost their lives. There was another armed conflict between Israel and Gaza in 2012. How will all this affect the prospects of a peace deal? Well, it certainly doesn’t make a peace deal more likely. For any peace deal to succeed, it will require the support of both Hamas and Fatah, the moderate Palestinian group that governs the West Bank. For quite some time, the two groups have been opposed to one another: Fatah cooperates with the Israeli government, while Hamas launches missiles into Israel. In April, the two groups managed to sign a unity deal, which gave at least some hope that a peace deal might succeed. But the current conflict is driving the two sides away from each other once again, and on Monday, a senior Hamas officials said that the unity deal is finished. That said, it’s not as if a peace deal was on the verge of being finalized when this happened. A long-term brokered peace deal between the Israelis and Palestinians has eluded leaders of all sides since Israel was founded, and lot of the failure comes down to the simple fact that both sides are very, very far apart in terms of their demands. While the current conflict definitely doesn’t help, there are unfortunately bigger obstacles in the way of a peace deal.